Over the first nine issues of the comic, the Rangers have been dealing with the treat of Rita Repulsa and her latest villainous ally—a giant, evil being known only as the Black Dragon, who’s been wreaking havoc by taking control over the Rangers’ Zords, priming them to level cities across the world. Before it can do that though, Tommy and Billy discover that the Black Dragon isn’t a monster like Rita’s usual cohorts, but a mecha, like their Zords. While the other rangers distract the Dragon and retake control of their Zords, the duo break into the giant beast and shut it down... which seemingly causes the whole thing to blow up, taking them with it. Because the Black Dragon is a seventh Ranger. 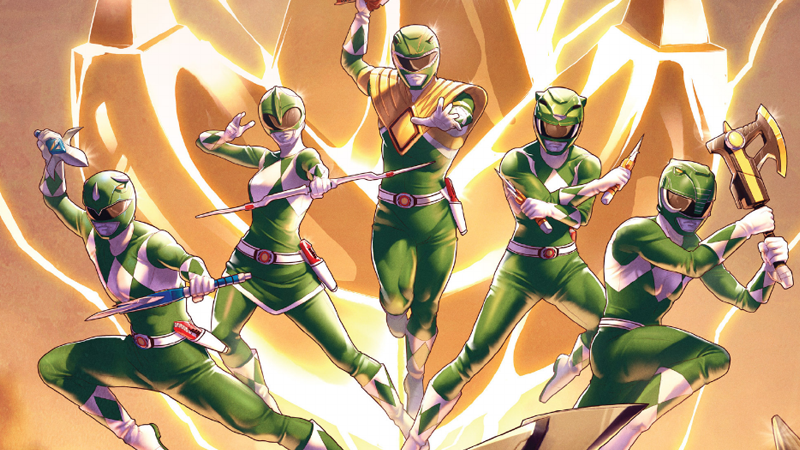 An all-new, all-mysterious addition to the original Mighty Morphin Power Rangers cast. Whoever this mysterious figure is remains to be seen—including if, as is the long tradition of extra Rangers in Power Rangers and the Super Sentai franchises, he’ll end up joining the main team after a villainous stint. But for now, he’s being set up as the true big bad of the comic series, and it’s kind of cool the book can mess around with Power Rangers canon like this.